This quarterly update of the Housing Impact of Shale Drilling Study and Dashboard (Appendix 1) includes lead indicators measuring oil and gas shale development activities in the third quarter and lagged indicators measuring the housing market in second quarter of 2016. 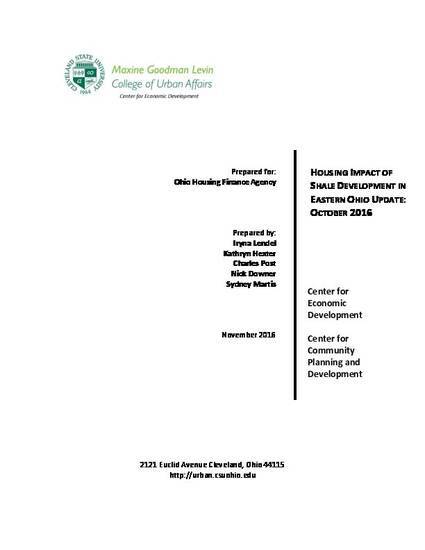 As with the first report and dashboard, the companion documents were prepared by a team of researchers from Cleveland State University’s Levin College of Urban Affairs (CSU) for the Ohio Housing Finance Agency (OHFA) to monitor the impact of the Utica shale development industry on housing affordability and availability in eight counties of eastern Ohio where the core upstream and midstream activities of shale development are concentrated. The eight counties include Belmont, Carroll, Columbiana, Guernsey, Harrison, Jefferson, Monroe, and Noble. Updates of the upstream and midstream activities are provided for all indicators developed in the initial dashboard and report: well count, potential employment, and oil price. In addition, an indicator reflecting sales tax receipts in eight counties was added to the dashboard providing a more complete picture of the impact of shale-related activity on housing. This indicator is a measure of mainly retail activities and indirectly points to an influx of non-local labor into the shale development counties. Further, the methodology used to project potentially generated labor has been revised to reflect total potential jobs generated by shale development activities during the quarter rather than newly created jobs. The housing market update for the second quarter of 2016 uses the five indicators developed in the initial dashboard and report: number of home sales, median sale price, days on market, rent per square foot, and rental vacancy rate. The indicators of multi-family affordability and availability derived from CoStar data include an update of the first quarter 2016 data as well. Rent per square foot and vacancy rate have been revised, as has the total sample size in terms of number of buildings and units. Costar is a “live database;” as such, data is continuously updated, even retroactively, so that historical numbers will be as accurate as possible.